Nestled in the foothills of the Pyrenees mountains, the small town of Lourdes is celebrating its 160th anniversary of the first apparitions. 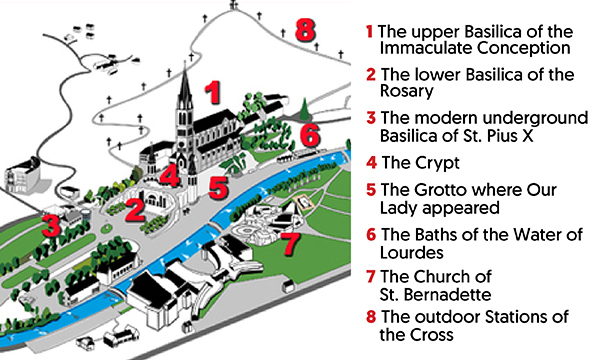 In 1858, the Virgin Mary appeared to a young shepherd girl Bernadette 18 times at the Grotto of Massabielle. Since then over 5,000,000 people visit Lourdes each year in hope of being healed by the spring water and to have a religious experience. For pilgrims, the main area in Lourdes is around the Sanctuary. Untouched by commercialism, this is a place of pure religious worship. A place to be healed whether physically, mentally or spiritually. The Pyrenees mountains act as a picturesque backdrop to the Basilique Notre Dame du Roasaire with the Gavee de Pau river separating the Sanctuary area from the main town. Mass is held in English daily at 9am in the Chapel of St. Cosmas and St. Damian. There is also a vigil mass every Saturday at 6.15pm. You can attend confession in English daily from 10am to 11.15am and 2.30pm to 6pm in the Chapel of Reconciliation. The Rosary is said in English at the Grotto daily at 2.30pm. You can do the High and Low Stations of the Cross daily from 6am to 10pm - high stations aren’t accessible to those with physical disabilities. Every afternoon at 5pm from April to October you can participate in the Eucharistic Procession around the sanctuary area, this procession is also known as the procession of the sick. At 9pm every evening from Easter to October you can join in the Marian Procession which is also known as the torchlight procession. For full details of daily events and times, visit www.lourdes-france.org and the pilgrim information office is just inside St Joseph’s Gate. You can sign up for a range of escorted tours when in Lourdes such as a One Day Pilgrimage, a 3 Day Authentic Pilgrimage or Guided Tours of the Sanctuary. These all work on donations, which vary tour to tour. In addition to the historic Grotto, you can visit Château fort de Lourdes, the fortified castle and botanical gardens. Or, you can take the 100-year-old funicular up to an observatory and platform that offers stunning 360-degree views of the Pyrenees and Lourdes. From June to October 2019, Click&Go will be offering flights to and accommodation in Lourdes with twice-weekly flights operating on a Friday and Monday. All our hotels are located within a short walking distance of the sanctuary. A taxi from the airport to your accommodation costs approx. €35 each way (1-4 people), €40 (5-6 people) or €45 (7-8 people). You can also get a bus from the airport to Lourdes town centre for €2 pp each way. Lourdes Airport (LDE) is 15-20 minutes drive from Lourdes town (distance is just over 11kms). You can see its transport options here. In Summer 2019, Ryanair will be flying from Dublin to Lourdes twice weekly on Friday and Monday. This schedule will begin Monday the 3rd of June and finish Friday the 25th of October. Dublin to Lourdes: Depart 8am & arrive 11:10am. Lourdes to Dublin: Depart 11.35am & arrive 12:45pm.